I found the DVD on sale a few days ago, I have more or less been looking for it since I heard about it. I was just sheer luck that I found it, as I wasn’t planning on checking through the box of various DVDs for sale, but I took a quick look at it as I went past. And there it was at the top of a pile, the Modesty Blaise DVD, I grabbed it 🙂 Didn’t bother checking for other DVDs even though it was a take three deal, but the price for a single DVD was good enough for me. Bought the movie and got it home by mail the other day. Sat down and watched it on Saturday evening together with my boyfriend. 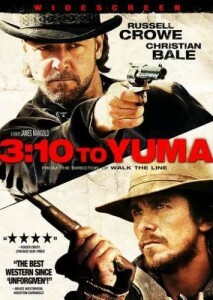 It is a story about escorting an outlaw, Ben Wade, to the train that goes to Yuma prison, it leaves the town of Contention at 3:10 pm.